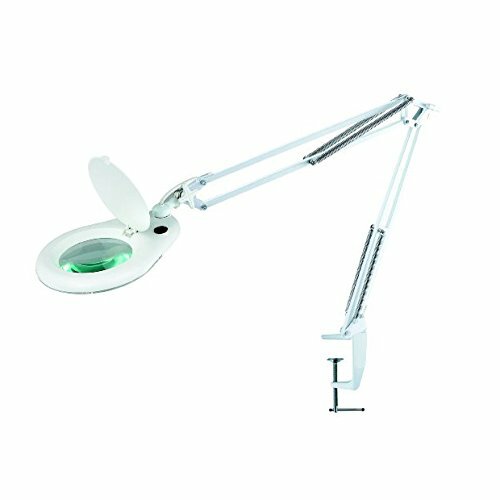 A lighted magnifier is a great help to tired eyes and for comfortably doing detailed work such as electronics or embroidery. Many crafters and people who work with anything that has small and intricate details will know how important good lighting is. If the light you use is not good enough, it doesn’t just make your job harder but also can cause damage to your vision over a period. Jewellers, clock repair specialists and different homemakers will be able to put their testimonies in about the meaning of good lighting in their workshops and studies. This is why having a lamp that also has a magnifying glass on it is so important. It makes life more comfortable, but it also prevents your eyesight from deteriorating as quickly. Here is our selection of the ten best models, that have received the best customer reviews as well as our own specific selection criteria. Following the reviews, we’ve created a helpful buyers guide with things to consider about purchasing a magnifying light. 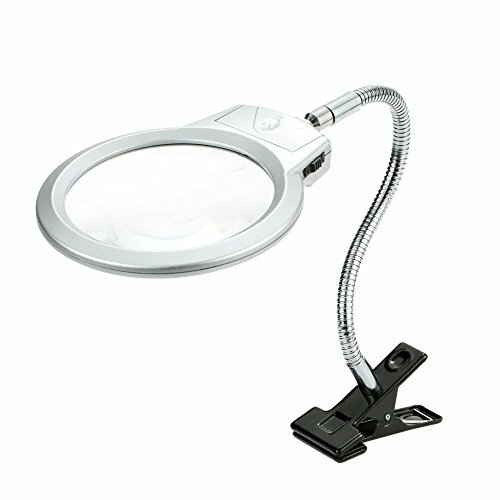 This is an LED-lighted 2x magnifier lamp with a 5x spot lens. Great for all hobbies and crafts for the whole family, whether it be stamps, model building, jewelry, or anything else you turn your hand to. Two super-bright LEDs are powered by the included AC/DC adaptor, but it can also use two AA batteries if you need to work in a corner with no power outlets. A wide 4″ acrylic lens makes it ideal for those who have trouble reading small print. The manufacturer also provides a limited lifetime warranty. 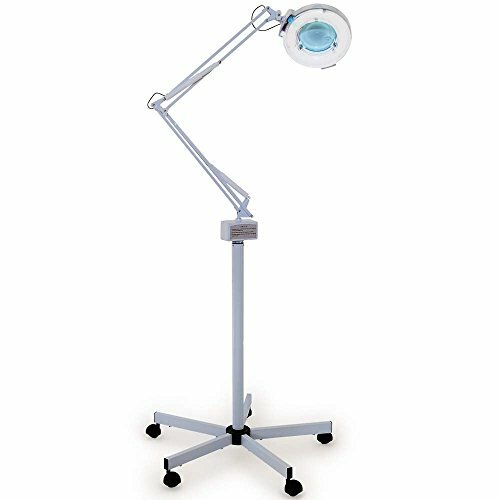 This LED-lighted magnifier is a large standing model that provides ample light and image enhancement for crafters who need their hands free. This is a sturdy unit featuring a durable neck that is easy to bend for close-up work, or extend to 54″ for larger workshop projects. Twelve powerful LEDs surround the 2x-magnifier lens, which features a 5x bifocal inset. A unique reflector system intensifies its light output. 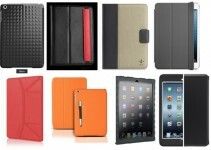 This product is easily assembled by hand, with a conveniently large power button. Optional battery power makes this a floor lamp you can carry from house to workshop without hunting for an outlet. It’s also well suited for relaxing in your favorite chair when reading or sewing. 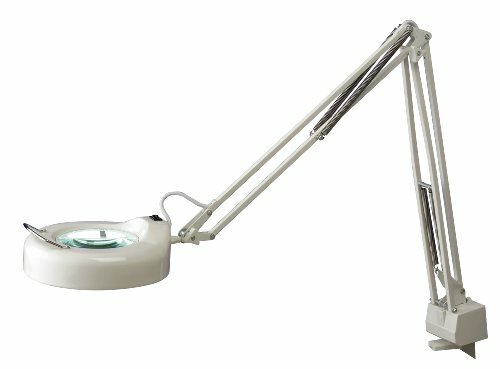 This is an LED lighted desk lamp that features 56 surface-mounted diodes (SMD) which provide a lot of light but use under 9 watts of power. They also last longer than most light sources, up to 100,000 hours! Output is bright enough for any kind of work, and when you consider the wide 5″ lens, it will fill any hobbyist’s needs for a good lighted magnifier. It also comes in a 90-SMD version that should be bright enough for the finest detail. The head pivots on a ball joint and the adjustable spring-arms can move easily into any position. A big 5″ lens with 12 long-lasting LEDs that give off bright but gentle light. This makes the lamp perfect to sit with comfortably for hours of reading or sewing. It also has a 5x insert that helps viewing the finer work. 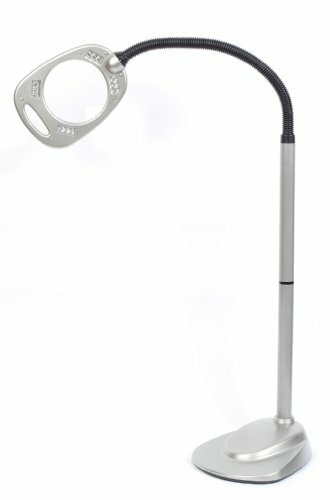 It’s surprisingly stable for such a light lamp, and at 53″ tall is easily adjustable with the flex neck. It’s great for doing your own thing while watching TV, with the lights below the lens and directed down to your work so as not to bother anyone else. Can also be run on D-cell batteries if you want to move where cords won’t reach. A 22-watt circular fluorescent tube provides a shadow-free light source to work with for those with weaker eyes that need magnification for crafts or fine print. 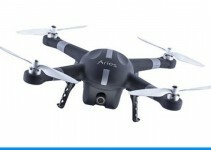 Has rugged metal housing and comes with a dust cover to protect the 2x lens. Clamps securely to any table and provides everything you need from a workbench magnified lamp. Wing nuts allow you to securely adjust the arms to any position you like. 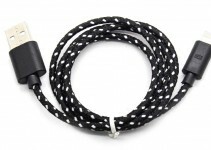 This a great workshop accessory for the price, and ships well-packed for secure delivery. A quality 5-diopter lens with a bright 22-watt light on a stable five-legged rolling base makes this a versatile tool when you need to move it from place to place . It’s a solid, well-built lamp that will survive years of service. Arms are easily adjustable and a 360-degree swiveling head means you can move the lens readily into any position you need. Height also adjusts easily from 3 to 6 feet. A 2.25x magnification lets you zoom in from up to 10″ away, but also comes with 5x 8-diopter inset lens for extra detail. Just as serviceable in a professional medical lab as a home workshop. Adjustable 42″ height with a white painted finish looks great on any workbench. The energy-saving 22-watt daylight spectrum illumination is easy on the eyes. Convenient rocker power switch and sturdy metal construction. The 5″ 3-diopter lens uses a surrounding circular bulb to illuminate your work or reading from all angles. This is a lightweight model with easily adjusted arms, that clamps securely to your work surface. It ships for free, with a manufacturer warranty on request. With 30 high-intensity 3500K LEDs and 30 high-intensity 6500K LEDs, it illuminates your work without the glare. The 1.75x magnification, 3-diopter lens, and 32″ spring balanced arm make it suited for finer work such as engraving or coin collecting. The arms are built of sturdy metal and provide ease of movement, while the base is easily and securely fastened to any desk or work table. Despite the low price everything about this lamp indicates quality. It’s reliable workmanship and ease of use helps reduce stress for hours of enjoyable hobby time. 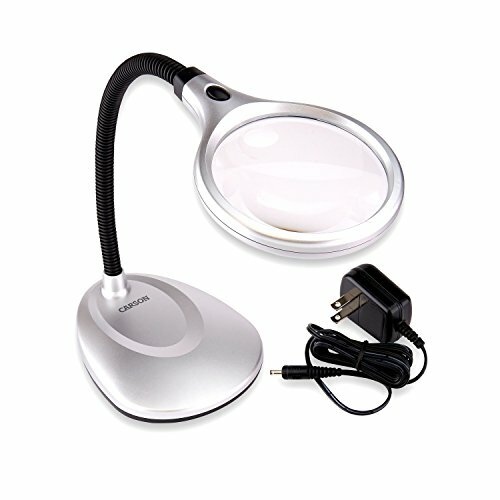 With 2 built-in bright LEDs to provide light even in darkened spaces, this magnifier is perfect for detail-oriented hobbies such as jewelry making or soldering. An easy-to-read plotting scale at the base makes it convenient to size objects, while three folding joints and a solid base allow for stable repositioning according to your needs. It is easily secured in any position with the handy screw knobs. It has a 2.5x lens for normal work plus a 5.5x magnification for examining finer details. The lamp is constructed of durable plastics and uses 3 common AAA batteries. 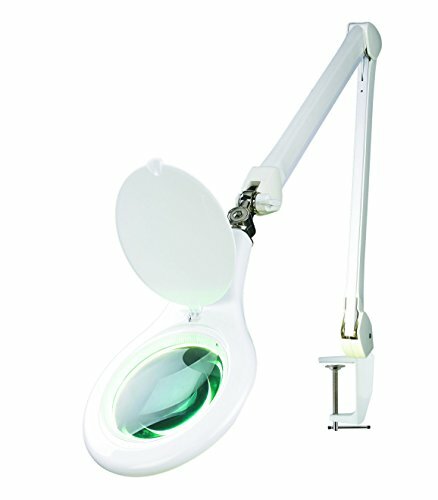 You’re sure to get a lot of use out of this handy little desklamp when its time to dive into your favorite hobby. The 3″ lamp lens is made of real diopter glass, not acrylic. 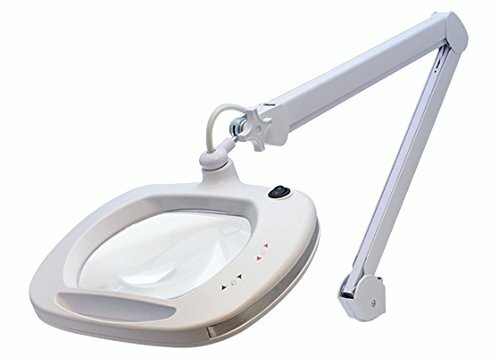 It’s well lighted with 60 LEDs, and gives a 1.75x magnification, perfectly suited for those with limited vision or those who just want to reduce strain on the eyes when doing home crafts. This white floor lamp has a weighted steel base and a slender, space-saving design, making it more stable and less likely to tip or be knocked over. This model has adjustable height from 42-55 inches, as well as a flexible neck, so that it can be adjusted for anyone’s comfort. The manufacturer has earned a reputation for standing behind their products. A magnifying lamp allows the light to shine on the object you are working on, as well as make the object bigger so you can see the little details. Thanks to the technology and design moving forwards there are now three different lighting options you can choose from. LED, fluorescent, and halogen bulbs are on the list of options, and the choice depends on your needs and requirements. LED will be less bright than a fluorescent bulb but it lasts the longest, and you don’t have to worry about replacing the bulb. LED lighting is one of the most popular types because of this reason since people want to save energy as well as change the bulbs as little as possible. On the other hand, a fluorescent bulb offers a whiter, cooler light without the shadowing of alternatives and you will be able to see clearer. Avoiding the shadows could be crucial while attempting to understand intricate details on a project or reading a text smaller than your eyes are comfortable with without the additional lamp. The third option is the halogen bulb. The light might seem more agreeable to a naked eye since it is warmer. However the bulb also heats up quicker, so you have to be careful handling it. This kind of lamp also runs the risk of going out unexpectedly right when you are in the middle of a fiddly project. You don’t have to be a crafty person to invest in one of these lamps since people use them in a kitchen reading recipes as well as merely adding lighting to a darker work surface. Everybody from cooks at home to office workers can benefit from more light that does not cast shadows, especially if the job involves straining your eyes while performing day to day tasks. 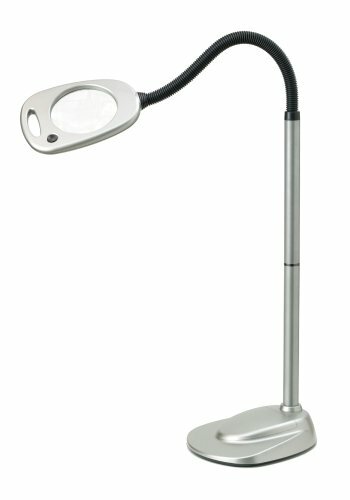 Using a lamp like this is as comfortable as using a hand-held magnifying glass. It won’t make you squint because of their brightness, but you should put in a good position from the start so you can focus on the task at hand. There should be about eight inches between your eyes and the glass itself for it to work correctly. Most of these lamps are either standalone desk lamps or have a clamp that allows you to secure it to a surface. If you don’t plan on moving it around, pick the one with a clamp. However, a simple desk lamp will offer you more flexibility to move it around and position it where necessary. There are also floor lamps for people who would like some additional light while they are reading a book or watching television since it will help preserve your eyesight. It is actual for young and older people alike since the TV, or a computer puts a strain on the eyes no matter how old you are. There is also an option for a lamp that does not have to be plugged in to make it work. There are battery-powered lamps so even if there is no electricity, you can still have a source of light drawing power from a minimum of two AA batteries. A good pair of batteries will last a good while, so it is an option worth considering in case of power outages and the need to continue working. It can become a backup source of lighting in attics or basements in case the regular power source is not working at that time. Another important aspect you should consider is the size of the magnifier. Different lamps are offering different stages of magnifying, and the choice depends on the detail of the work as well as the size of it. Most of them have a dioptre number of 3 or 5 and depending on the lens the magnifier is between 1.75x and 2.25x. Make sure that you are aware of the safety suggestions of using one of these lights such as Electrostatic Discharge safety and not exposing them to a direct sunlight since they can become a fire hazard. You can achieve the same level of sunshine concentration you would go with a hand-held magnifying glass, so it is an important aspect to remember.